$AHM: What’s My true worth? 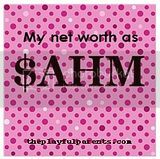 $AMH, WAHM, (T)SAHM. You can say that my work status now is “complicated”. For the past 2 years I have been in a transit state regarding my employment status. I haven’t official quit my FT job and am still on NPL since Tiger girl was born. However in the meanwhile I have started expanding my freelance portfolio and items that I do to add to our family income. For those that are new to the blog I was teaching full time as an elementary school teacher at a neighbourhood school before Tiger girl was born. Each time when the kids were born I would take minimum two years off work to fully care for them. R and I agreed that it was important that the kids get the best care from infancy and be given the best education too. When Tiger girl was born Monkey boy was in K2 and I had to prepare him for Primary One. It was a great time for me to be home as I could personally oversea his transition from Kindergarten to Elementary school. Fast forward two years and I’m currently overseeing Doggie boy’s transition to Elementary school. It makes more sense for me to stay home then to rely on Childcare for Tiger girl and after school care for both boys while I go back to work full time. The kids will not be able to get the undivided attention that they need from me. It will be a real irony if I have to spend more time coaching other kids then to spend time with my own kids who need my time the most. At the end of the day I would want to say that I have put in my best and gave my kids 100% then to have neglected them during their formative years while pursuing the corporate ladder. I rather have 3 students then face a class of 43 or more on a daily basis. Year end bonus and having to face yearly performance assessment while at work are something which I don’t miss. I don’t need all the stresses of the corporate world and deal with the different types of snakes in the workplace on a daily basis. I do get my bonuses but they are more in the form of love and gratitude from the ones that I love the most. The pay as a professional blogger, freelance writer and web designer is not as regular as a teacher but it does come with much more perks then my “original” job. I do get to go more places and try out many new things which I wouldn’t have been able if I wasn’t on No-Pay-Leave. For once I can go for holidays with the kids during the off peak season. The kids get the assurance that I am around for them and they get plenty home cooked meals, bakes and lots of fun indoors and outdoors once school is out. I get to indulge in my other hobbies ~ cooking, baking and photography and have more time for reading too. I have better chance to manage my own time and set my own goals and schedule. The best of all is that I also help R save tons of money if I had to outsource the following jobs. My true worth in $$ is certainly much higher if I add in all these potential expenditure if I were to continue working. I’m blessed to be able to spend time with the kids while at the same time adding to the family finances being a WAHM. I’m enjoying the best of both worlds and being a very PRESENT mom to my 3 kids.